This unbiased steam shower buying guide shows how to buy or build the best steam shower, including custom steam showers, modular units, and steam generators. Floor-to-ceiling tempered glass wall and door enclose this steam shower. Steam showers have been popular at gyms and health clubs for decades, thanks to their ability to help relax muscles, soothe aching joints, and invigorate tired bodies. Now steam shower manufacturers focus on the home spa market, offering homeowners a range of products from complete steam shower units to equipment that can add steam capabilities to a conventional shower. These products offer a great way to install steam showers in residential bathrooms for the ultimate in comfort and luxury. Because steam showers are relatively new to American homes, most homeowners don’t know much about what to look for when buying one. This steam showers buying guide will help you sort out your options. A steam shower is essentially a small, enclosed room with a steam generator and a vapor-tight door. The steam generator heats water to a boil and then delivers the resulting vapor into the enclosed room. 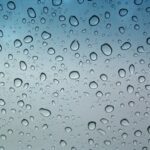 Tile or another material that is impervious to hot, moist vapor covers the walls, ceiling, and floor of a steam shower. Inside the shower, a seat or bench gives you a place to relax while you enjoy bathing in the steam. 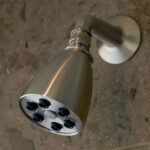 In addition, nearly all steam showers also serve as regular showers with water controls and one or more shower heads. Buying a steam shower isn’t like buying a washing machine. In addition to the cost of the equipment, expect to pay a contractor to install it. And know that, because a steam generator puts a tremendous amount of moisture into the air, the shower enclosure—and the bathroom—requires custom design or consideration to prevent mold and/or moisture damage. People with certain medical conditions—such as high blood pressure and diabetes—should not use steam showers without consulting a doctor first. Pregnant women and very young children should never take a steam shower. You can buy a steam shower as a complete kit, ready for installation. Or you can buy a steam generator and install it in a custom-built enclosure. First you must decide between a prefabricated, manufactured steam shower or a custom-built one. In addition, if you plan to install a custom steam shower, expect to choose the right type of steam generator to buy. Buying a modular steam shower unit is the quickest and easiest way to get a new steam shower. Typically priced from $3,000 to $5,000, prefabricated all-in-one modular steam shower units have integral doors, molded seats, steam dispensers, multiple showerheads, and more. In one of these, you can enjoy either a steam bath or a regular shower—and some steam shower units even have whirlpool bathtubs at the base. Made of easy-to-clean acrylic, these waterproof enclosures keep water vapor from escaping into the rest of the bathroom where it could damage walls, wallpaper, and paint. Steam shower offers luxurious comfort. Basic sizes and configurations fit the space of a conventional bathtub/shower unit. As a result, replacing an existing tub with a steam shower unit may not require excessive reconstruction. Most provide for easy installation and hookup to plumbing. Don’t expect a lot of color choices. 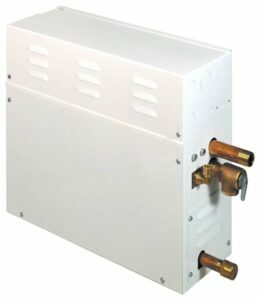 Most modular steam shower units come in white or off-white. Look for a model that has a textured floor to reduce the potential for slipping. Acrylic modular units often don’t visually integrate as seamlessly into a bathroom as elegantly as custom-made steam showers that employ the same tile, stone, or other materials used elsewhere in the room. You can buy modular shower steam units online and at home sauna and hot tub stores. Check out the many different brands, because each has its own special features. Popular makes include Kohler, Whirlpool, Wasauna, Finnleo, Steamist, and LineaAqua. For example, Wasauna’s acrylic steam showers feature fiberglass reinforcement for greater resilience. LineaAqua offers a variety of ultra-modern designs, including the Caesar model, a freestanding circular enclosure made of tempered blue glass. If you order a modular steam shower online, double-check dimensions. Either request the location of a showroom you can visit or ask the manufacturer to send you photos before you buy. Also discuss any plumbing and electrical requirements. If you purchase a steam shower kit from a local dealer, ask for the name of a plumber or electrician with experience in adding these devices to bathrooms. This should save you money on the costs for installation. Get a one- to three- year warranty with a steam shower unit. The last thing you need is a leaky unit or one that fails to produce enough steam. Without a warranty, you may face expensive repairs and not get complete satisfaction. A custom steam shower usually works best if you want a steam shower that will blend beautifully into your bathroom. 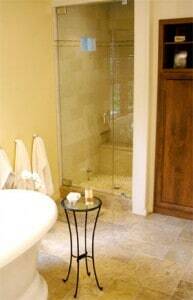 Glass door is fitted to retain steam in this custom steam shower. What is a custom steam shower? Basically, it is any enclosed shower that is connected to a steam shower generator and designed to handle water vapor. In most cases this means a shower that is completely tiled on the floor, walls, and ceiling, and that has a door that completely seals. It usually has some type of seat. In most cases, you build a custom steam shower from scratch during bathroom construction or remodeling. 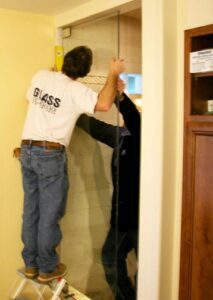 Of course, in a custom job, you can add any amenities you want, from waterfall shower heads to panel showers. For optimum performance of the steam generator, the shower ceiling should be no higher than 8 feet. 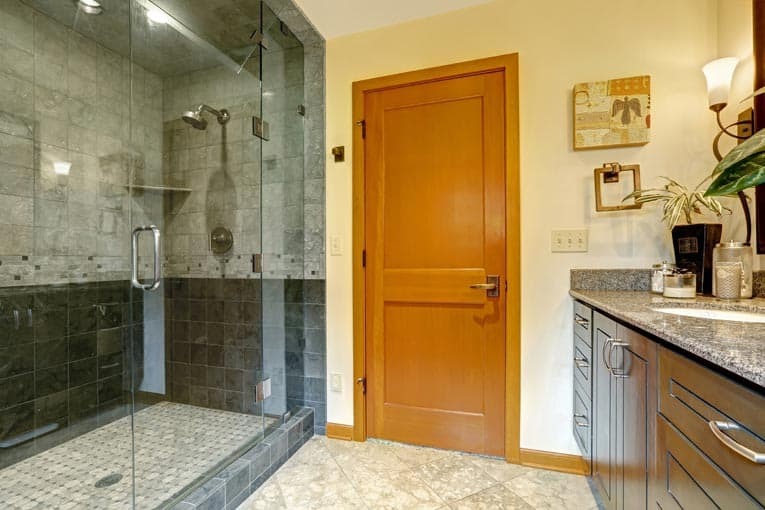 Custom steam shower adds luxury to this elegant bathroom. Depending on the work involved and the finishes and equipment you choose, the cost of a custom-built shower steam room can run considerably higher than that of a modular unit. 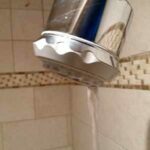 Simply converting a shower, however, can cost less. For this type of steam shower, you just install a shower door that seals, cover any un-tiled surfaces with tile, and to install steam generator and its controls. One caveat: For water-resistance, tile set tile in a mortar bed—don’t stick it to water-resistant drywall with adhesive (discuss this with a tile contractor). Water vapor from a steam room can damage your home if not properly controlled. Some of today’s steam showers—aptly called “shower suites”—are loaded to the gills with features. As you might guess, prices can run sky-high. A luxury shower suite can cost from $20,000 to $30,000. Some of these are like water theme parks. Options include aromatherapy, aqua-pressure foot massagers, waterproof radios and CD players, iPod hookups, hands-free telephones, fluorescent mood lighting, ceiling rain showers, multiple water jets, waterfalls, and body sprays. They range in size from small to immense and accommodate from two to 10 people. The heart of a steam shower is a steam generator, which produces steam (water vapor). If you’re building a new steam shower, you’ll need one of these. Popular steam shower generators are sold by Kohler, Steamist, SteamSpa, Mr. Steam, and Steam Planet. Figure that you’ll pay from $500 to $2,500 for a steam generator, depending on the size and features. Most home sauna and hot tub stores should have a model for demonstration purposes. The unit pictured at right connects to your home’s plumbing. It has a stainless-steel reservoir equipped with a thermostatically controlled electric heating element, which, when turned on, boils the water, producing vapor. This vapor is then delivered to the shower through a special dispenser at the bottom of the wall. Because the vapor is super-heated, the nozzle is generally insulated and/or shielded to guard against burns. The generator can be installed up to 25 feet away from the shower, so it can be hidden under the vanity, in a closet, in the attic, or under the floor. Controls allow users to set and monitor temperatures. Control panels may mount inside or outside the enclosure, or both. Where two controls are used, the inside one shows the exact temperature, features a temperature adjustment, and has a shut-off. The outside control has a timer that’s used to automatically shut off the vapor after a specified period of time. Buy a steam generator that runs quietly and produces the required amount of steam quickly, evenly, and efficiently. Generators each have a power rating, depending upon how much electrical power they draw per hour. Generally, the higher the rating, the more steam they produce. The generator must produce sufficient steam for your shower enclosure. So begin by measuring the interior space of your steam shower and calculating its cubic footage, multiplying length times width times height. Then refer to this chart to find the size of unit that can handle that number of cubic feet. Though this chart is based on Kohler’s recommendations, these sizes will work for most products. Before buying, read the product’s specifications to confirm the proper size and expected performance. For example, some steam generators start producing steam in less than two minutes. Others automatically reduce output after reaching a pre-set temperature, allowing for a steady flow of moist, hot air instead of short blasts of steam.